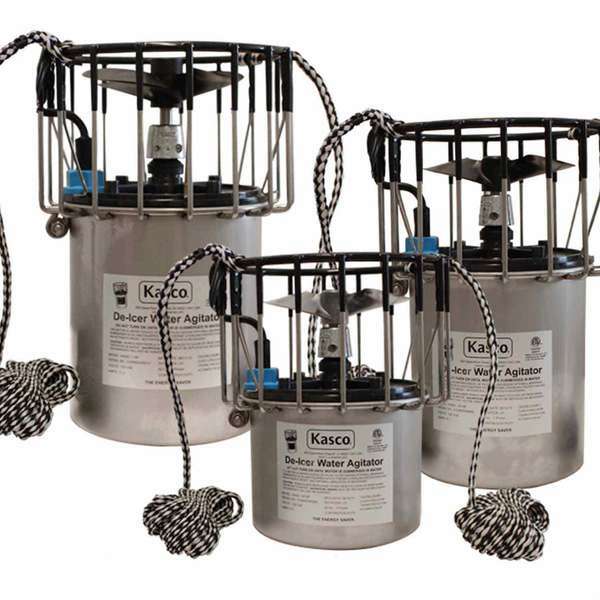 Kasco De-Icers circulate water to melt ice and prevent its formation in your boat's slip. De-Icers can be hung from a vessel, dock or other flotation device and positioned to move warmer water from a deeper channel to the shallower area where your boat is moored. This helps to protect your boat and dock from lifting damage due to “ice jacking” and the shearing and crushing damage caused by ice expansion. Motor assemblies are sealed in an oil bath for long life, and feature ball bearings for smooth operation. All exposed metal is non-corroding stainless steel. Each assembly includes a power cord designed for low temperatures, zinc anode for corrosion protection and a grounded three-prong plug. Optional thermostat/controller cycles De-Icer automatically to save energy. All Kasco De-Icers are ETL approved to UL and CSA standards. By using a Kasco De-Icer, you are ensuring your property and aquatic life are protected from the harsh winter conditions. Suspended Operation: Kasco De-Icers come standard with two 20' mooring ropes for easy suspended operation. Simply tie each rope to either side of the de-icer unit and secure the ropes to your dock, piling, or other waterfront property. Universal Dock Mount: Easily mount and position your de-icer unit on a dock, piling, or other waterfront property with the universal dock mount kit. Using a 1" diameter stainless steel pipe* and engineering-grade composite mounting hardware, this sturdy mounting system lets you seamlessly rotate the unit under water and change its angle and depth. Industrial Dock Mount: Industrial dock mount kit offers the same beneits as our universal mounting kit, but is recommended for use in harsher, industrial applications. Made up of a 1 1/2" diameter corrosion resistant stainless steel or galvanized pipe* and stainless steel mounting hardware, this system is built to withstand even the toughest environments. * Customer provides stainless steel or galvanized pipe up to 10' long. Which Size De-Icer do you Need? Many factors affect the size of the open water area. In general, the 1/2hp model keeps a 50' diameter area from freezing while the 3/4hp model keeps a 75' diameter area ice free. De-Icers may also be used during the summer months to eliminate stagnant water and improve water quality.